If my knees or hips are hurting, stairs are a bugger. Up and down are painful. But, there is no denying they are visually interesting. 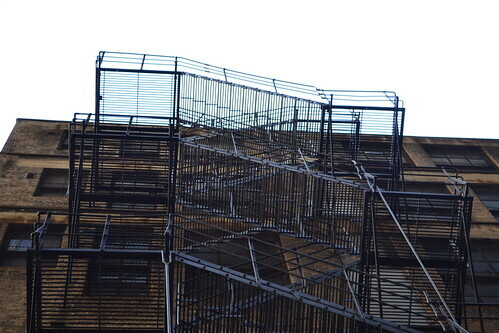 Take the ubiquitous metal fire escape. Seen from below, they parcel and slice the sky into small sections and snake up the side of a building. When I have to inspect an older brick building, I always fret that I will have to do the exterior by walking out onto the fire escape. 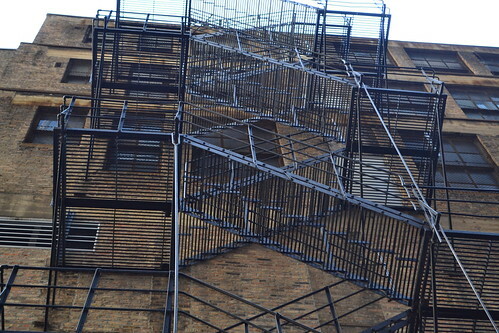 You all know I'm afraid of heights and these metal fire escapes are the absolute worst places to be. I can't grip the railing any tighter and it feels as if I will turn to pudding and drip through the grate, falling to my doom x number of floors below. But there is no denying the photographic interest in a fire escape on the side of an old Chicago brick building. And then there were these stairs. These were in the service section of another apartment building. 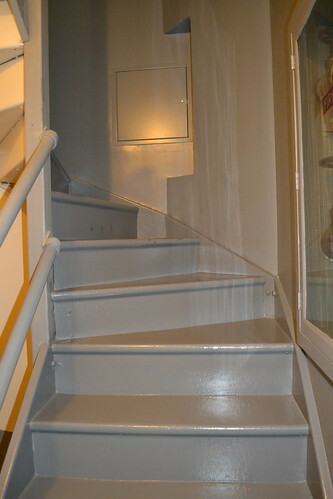 Not much additional space had been added for a widening of stairs. I don't know if there had always been a spiral staircase here or if the original had been wider and was cut down to accommodate larger apartments. The plus of this was no center view either up or down which would have made me feel queasy when we went from 10 to 12 and down to 11 and back up to 12. At best, you saw down to the next level. 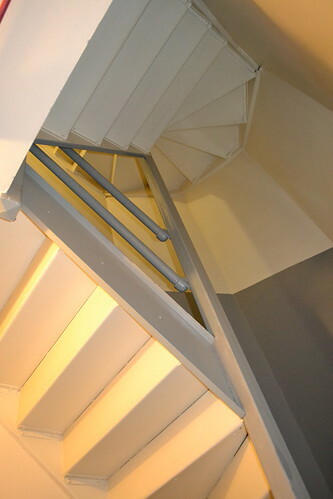 The biggest issue was the narrowness of the stairwell and treads. I have to go slow now on stairs and felt I was holding people up behind me as I negotiated the climb. Still, I like the look of stairs. If I can take my time, they can be very visually interesting.